The Martina McBride song, "Happy Girl" came on the radio while I was cutting up celery and green peppers in the kitchen tonight for dinner. It's always been one of my favorites, perhaps because of its great message. And definitely one I needed to hear tonight. I haven't exactly been a "happy girl" this week. Not that it's been a bad week, but I caught myself being sad about Grace's diagnosis and struggles. I caught myself wishing that my problems were figuring out how to get crayons or markers off the walls, trying to teach her to share with others or even hearing her say that she's mad at me when she doesn't get her way. Because somehow, someway, I think I could solve those problems. Instead, this week, I find myself trying to juggle how to get Grace to two sessions of speech therapy, two sessions of physical therapy (one is an hour from our house), and three days of preschool. I had to figure out how to try and get her to sit up straighter in her chair and in the bathtub. I have to call equipment dealers to set up appointments for MORE equipment in my home, and then find a place to put it. And somehow, someway, I'll figure out the answer to those problems, even if I don't want to. But what tugs at my heart is a problem I can't solve: Grace's diagnosis has no treatment. Most days I can make peace with things and have faith in God's plan for our lives, even if it looks nothing like the plans I made. I trust God has His reasons, even if I don't understand them. So, I'd been having a pity party for myself this week and our situation. The song "Happy Girl" came on the radio tonight, and reminded me that "the sweetest thing that you'll ever see in the whole wide world is a happy girl." And I get to be the mom to the happiest little girl in the whole wide world, every day. Her smile and laugh challenges me to be that very same "happy girl" just for her. And find ways to be happy in ALL the little things. Today after physical therapy, Grace and I went shopping with my mom, and just happened to find some cute little Minnie Mouse shoes. When we first found out that Grace would need AFOs (ankle foot orthosis) braces, I was sort of crushed. It broke my heart to walk down the kids' aisles in the shoe store and see all the cute little sandals and dress shoes that her braces just wouldn't fit in. We ended up with a pair of "skater" tennis shoes that were wide enough for the braces, and she wore them with everything, even dresses. For awhile, I figured that someday she wouldn't need the braces, and she and I could shop for fun shoes again. While that may not be the case, today, we found another little reason to smile. 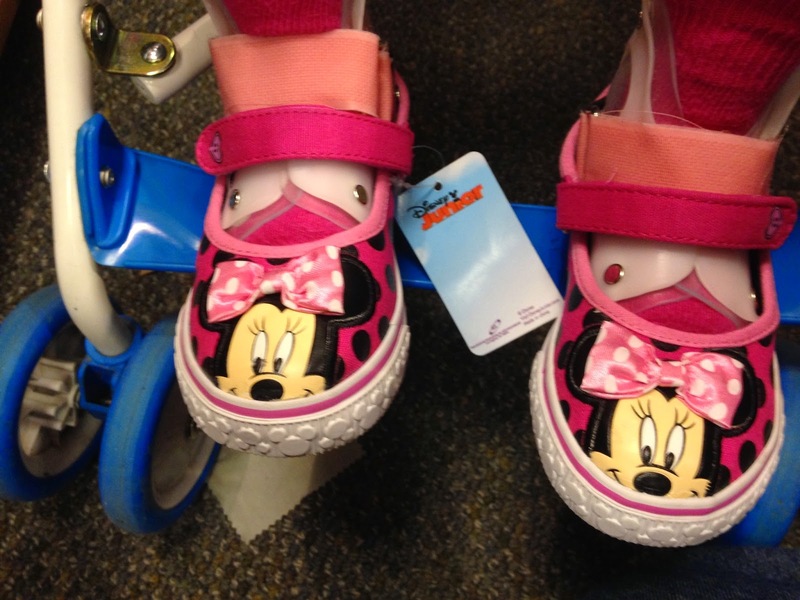 I just happened to see these darling Minnie Mouse shoes in the clearance aisle with a long strap that goes across the top, just long enough to go over her braces. I think she and I both smiled when we put the pink Minnie shoes in the cart. I can't wait for her to wear them for the first time, and I hope they will serve as a reminder to me to smile and laugh and be the "happy girl" that Grace is each and every day. You are entitled to have a bad day here and there Mary. I know this is very difficult and my heart goes out to all of you. I got my bracelets and wear them all the time. I will be sending money in Gracie's name. You are a wonderful mother and Grace is very fortunate to have such love, support and prayers coming her way all the time. Love to all. Mary you are entitled to have a bad day once in a while. Grace has such a wonderful support system with family, friends and others. I always look to see your new posts. I pray all the time for a cure. You are a wonderful mother and I can't imagine how hard it is to know there is nothing you can do. However, keep the faith. Love and prayers to all. The shoes are really cute and I'm sure Grace will smile every time she wears them. That smile looks at me daily with the picture you sent me. I know none of us can begin to know how you feel but I want to know the family is always-good days or bad. She is an angel and is lucky you and Kyle are her parents.